SalonQP was launched in 2009. Since moving to the Saatchi Gallery from Number One Marylebone, the annual event has continued to gather momentum and reputation, helped, no doubt, by its new owners, the Telegraph Media Group. This year, over 90 watch and watch-related brands were represented, ranging from well-established manufacture to independents, including some names that had not been seen in London for some time. It wasn’t the first time I’d seen Ludovic’s Upside Down watch. Unfortuneately, the last time had been in the dingy back room of a Geneva casino in snowy January. Ludovic had been exhibiting as part of SIWP, the Swiss Pavilion of Watchmaking**, alongside Emmanuel Bouchet, Vianney Halter, Akrivia and Kari Voutilainen, but it had been difficult to photograph the watches, as light was at a premium. In the brightly lit galleries of SalonQP, however, this was far less of a problem. It also allowed me to hold a brief, if somewhat stilted, conversation with Ludovic, who made good use of Google Translate while I fumbled to recall my Additional French vocabulary***. Jumping hours are still relatively rare in modern watches, although they have an illustrious heritage, with Breguet himself producing a number of pocket watches and clocks with this complication^. While most complications will either advance one or more hour hands, or perhaps drive a digital disc or two, Ludovic’s take is somewhat contrary. 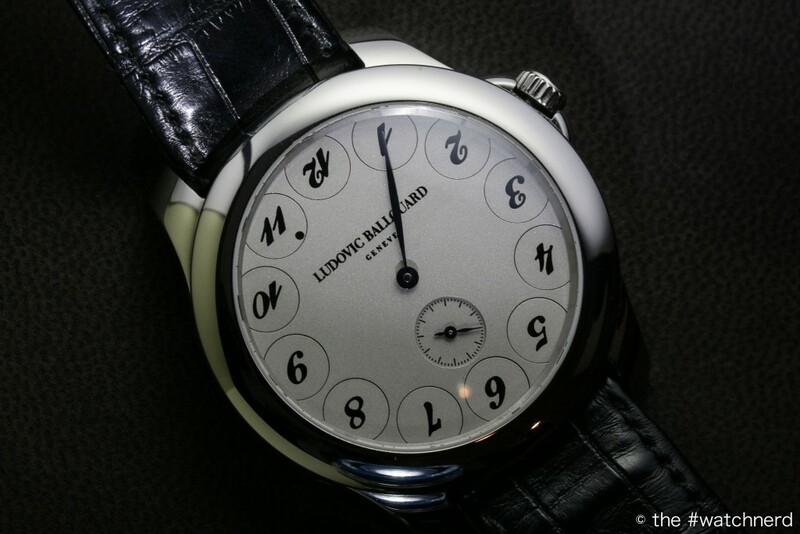 At first glance, there’s something slightly unsettling about the watch: the numerals are all upside down. If, as above, you happen to catch the watch at eleven o’clock, then the illusion is even stranger. However, a closer look reveals that, below one numeral is a black dot, and that this number is the right way round, indicating the current hour. 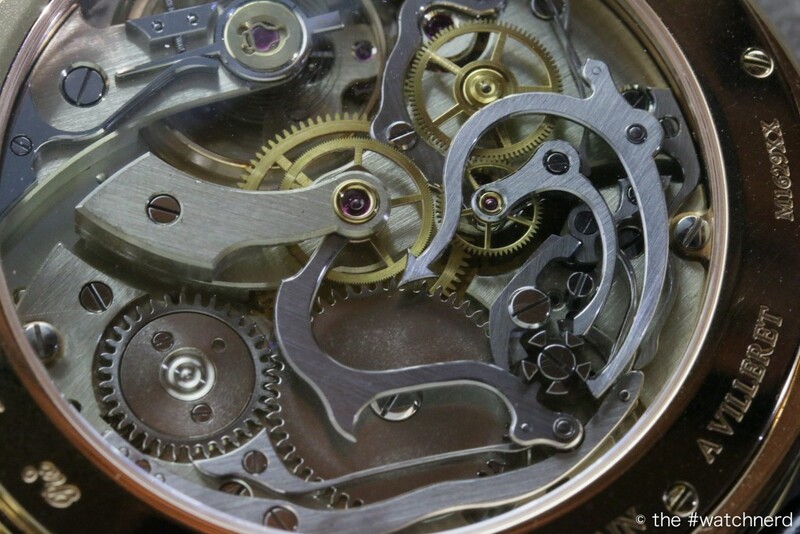 As the minute hand progresses around the dial, energy is stored in the jumper mechanism and is released, nearly instantaneously at the change of the hour. Unlike “standard” jumping hour complications, Ludovic has had to design the mechanism to act on two numerals at once: one to turn the old hour upside down, and a second to right the new hour. The Upside Down watch’s B01 movement is, in fact, loosely based on a Peseux 7001, although you’ll be forgiven for not noticing. As can be seen in the photo above, there are twelve “Maltese crosses” distributed evenly around the edge of the movement, each corresponding to a number on the dial. Maltese, or Geneva, crosses are often seen in the stop work of mechanical watches, but can also be used to translate continuous rotary movement into an intermittent movement, i.e. advance the hours as the central nautilus-shaped cam completes its hourly rotation. Two springs can also be seen – one to store the power for the jump, and the second to maintain tension. All this is combined with a little dial-side trickery, as the small dots beside each numeral are hidden from view beneath the bezel until required. I didn’t manage to get a good video of the hour change in action, but WatchesTV has a rather nice interview with Ludovic (in French, but with subtitles) which also includes a demonstration of the watch. Ludovic also brought along his Half Time watch, photos of which can be seen here and here. 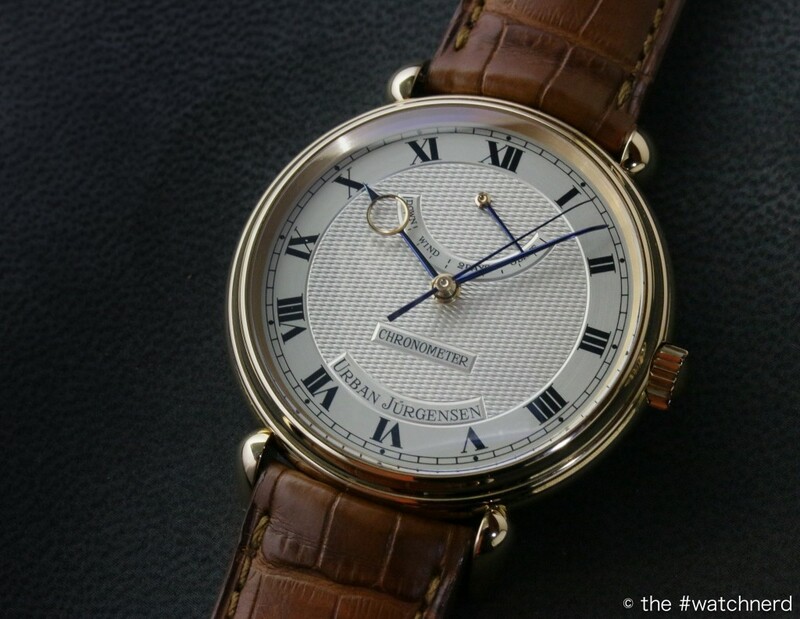 Another brand that had not been seen in London for some time was Urban Jürgensen & Sønner, who picked up the Men’s Watch Prize at GPHG in 2014 with their Centre Second model (seen below). Some of you may also remember that the ownership ofUrban Jürgensen & Sønner returned to Danish hands during the same year, when a group of investors took over the company and Søren Petersen was appointed President and CEO. 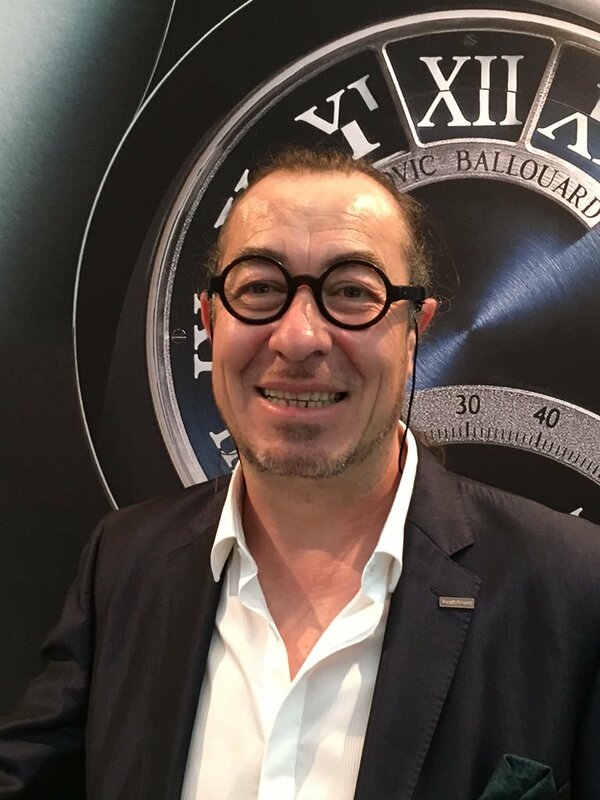 This is one of the reasons that, for me, SalonQP is such an unusual and unique occasion: there is no selling (unlike Basel), and there is little brand politics (unlike SIHH), but instead, a collection of unusual and interesting designers and manufactures from a wide cross-section of the market. While the Urban Jürgensen & Sønner brand goes back to 1773, recent history has focused on the development of a unique escapement, under the direction of Peter Baumberger and Derek Pratt. The story of this movement is fascinating and deserves a much more in-depth post. Suffice it to say, the production of a serial wrist watch containing a pivoted detent escapement is remarkable. Indeed, until recently, many thought it impossible. Pivoted detent escapements were first developed by John Arnold in the eighteenth century, and, indeed, Daniels makes mention of the potential accuracy of this form of chronometer escapement in Watchmaking^^. 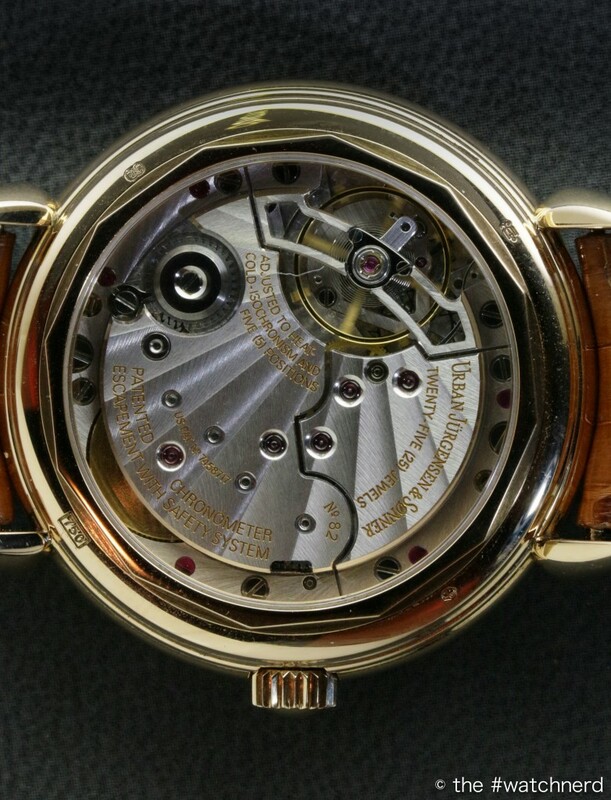 The P8 movement is, therefore, rather unusual: not only does it make use of a pivoted detent; but it also runs at a rather unique three beats per second. The detent was designed for use in a marine chronometer, not for a pocket watch, or even smaller wrist watch, and has therefore had to undergo a number of modifications. Unfortunately, I spent most of my allotted time with UJ&S taking photographs, badly, rather than asking about the escapement. When faced with the Reference 1142C and a Reference 10 for the first time, I fell in to the trap of attempting to capture their likeness, rather than understand their mechanisms. One can (usually) find photos to use to illustrate ‘blog posts; however, it’s far, far harder to replace a lack of content. The dial and hands are equally interesting, and perfectly made. The guilloché brings to mind Breguet and Daniels, Smith and Voutilainen (the latter worked with Peter Baumberger for some time and remembers him with great fondness), while the hands reflect light in the way that few others are able. I’m told that this is due to the unique method of production: the hour hand is composed of four individual parts that are either soldered or pressed together to form the whole. 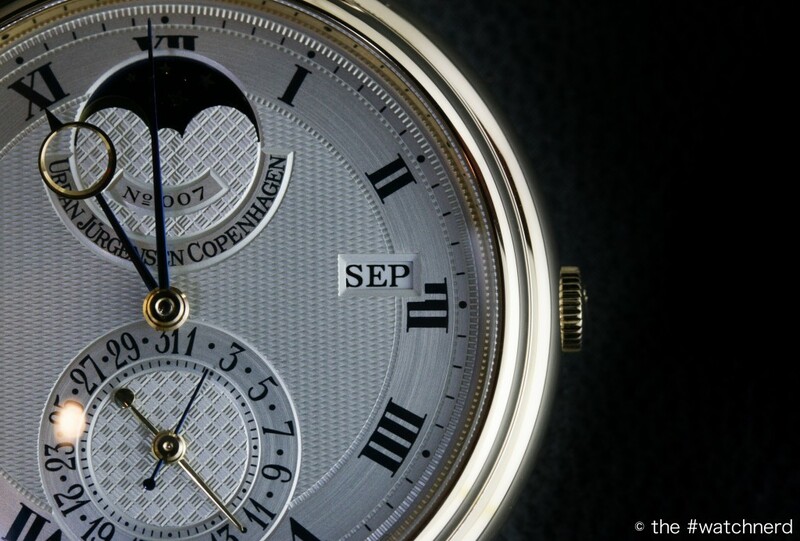 While at first glance, the rounded shanks and “moon” tips may be reminiscent of Breguet, they are far more complex. The moon is created in two parts, by hand, with the centre “eye” piece held in place within its circular sibling by friction. This eye is bevelled in an asymmetric manner that is not immediately obvious. However, closer investigation reveals that the insert is thinner towards the top of the eye, and has a shallower bevel at the bottom. 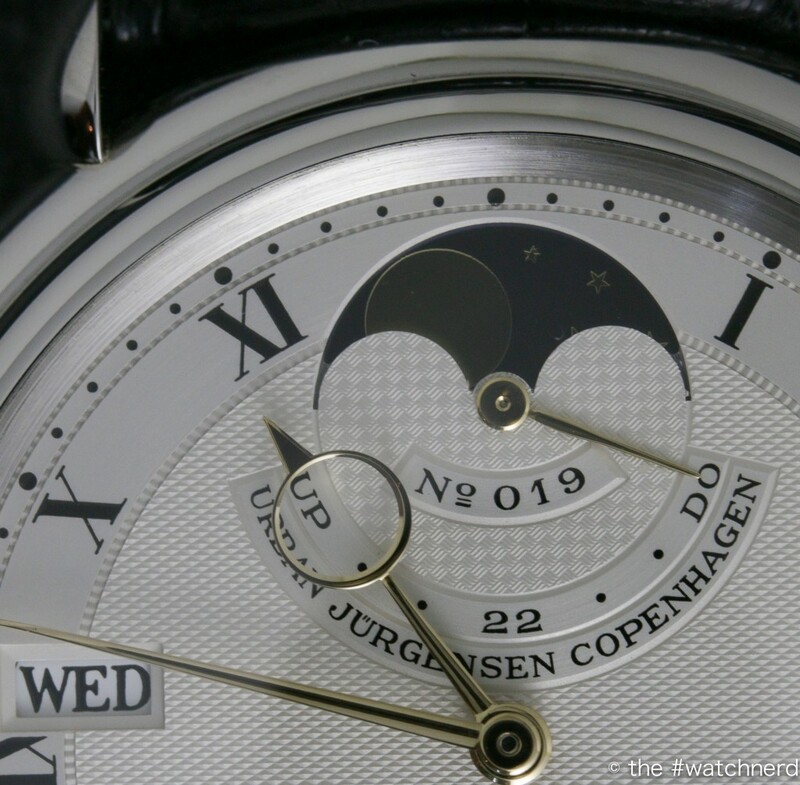 Anecdotally, I’ve heard that the signature Urban Jürgensen hands were designed by Peter Baumberger, who made the first set himself, having tired of trying to explain his idea to his watchmakers. Not content with their chronometer movement, Urban Jürgensen also offers a perpetual, in the form of the Ref 3 and the Ref 10. Both of these watches have the most beautiful moon discs, that my photography almost completely fails to capture. And the lugs. The size, shape and angle of the lugs differs from Reference to Reference. Again, it may not be immediately obvious, but these lugs have been carefully designed both for their aesthetics and the comfort of the wearer, painstakingly pressed from solid metal and then soldered invisibly to their cases. 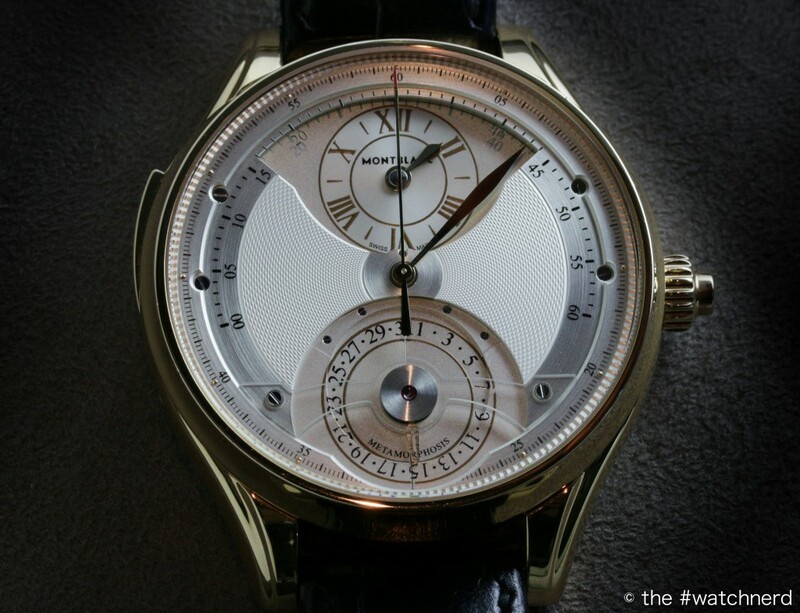 The Montblanc Metamorphosis II has eluded me for some time. The first prototype was shown at SIHH 2010, if I remember correctly, and I had been hoping to see it at both SalonQP 2010 and 2011. However, for whatever reason, an operational version failed to make it to London. Five years ago, the Montblanc brand had been better known for its pens than its watches, although by mid-2012, the Villeret-led charm offensive had been launched. This resurgence has been continued by Jérôme Lambert throughout his reign as CEO, culminating in some impressive recent releases. The Montblanc M67.40 movement on the Metamorphosis II is a deceptively simple hand-wound chronograph, beating at a leisurely 2.5Hz (18,000 vph). It is, of course, a Minerva Villeret creation, as can be seen from the instantly recognisable serpent’s tail. 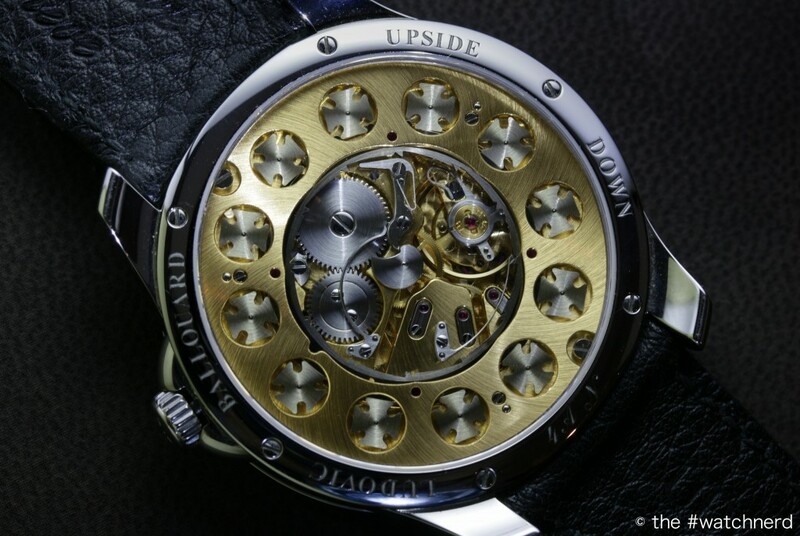 But this watch is not about the movement, it’s about what lies atop, betwixt it and the dial. The Metamorphosis II follows the same basic principles as the original model: a watch with two faces that the wearer can switch between at will. Like its progenitor, the watch is a regulator, with a central minute hand, hours at twelve and date at six. The second, initially hidden, dial also hides a second complication – a chronograph with a 30-minute register. Of course, my initial focus was on this remarkable mechanical hemimetabolic process. 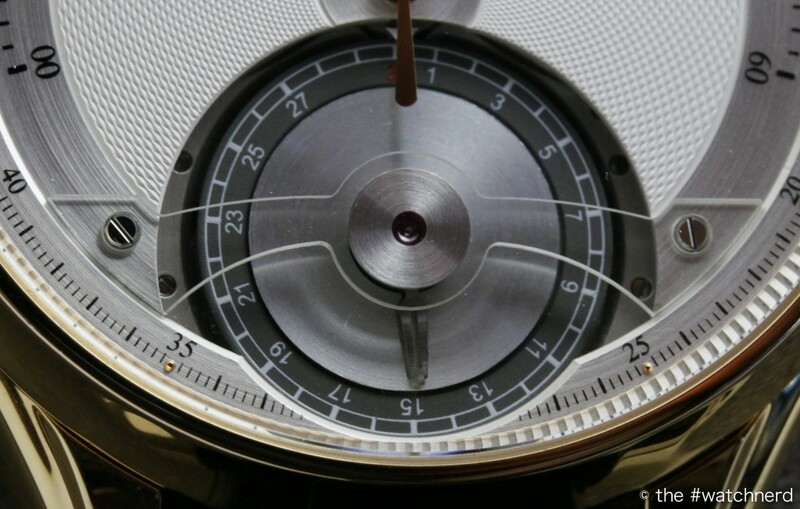 By simply pushing the repeater-like slide, the two sets of elytron-esque leaves at twelve and six, open up and fold away under the remains of the guilloché dial. While it only takes about five seconds to reveal the chronograph functions, it’s hard not to (metaphorically) hold one’s breath while the transformation occurs. It’s a delicate moment, reminiscent of seeing an 18th century automaton or similar marvel; there’s a slight whirring that’s not dissimilar to the noise made by large Tanzanian scarab beetles. But that’s another story. With another push of slide, the dial reverts to its original state, hiding the modern-looking sub-dial under a tile of roman numerals. This is a remarkable watch and it was certainly one of the highlights of SalonQP for me. Not being part of the global press corps, I, like many other #watchnerds, need SalonQP in order to see watches like this or the Ref 10. SalonQP brings brands to London that are otherwise unseeable. Long may it continue. ** SIWP will be back this month (January 2016), with 20 exhibitors, including Vincent Calabrese, Antoine Preziouso and the slightly bonkers WatchE. If you’re in town for SIHH, do pop in. *** Actually, my comprehension skills have improved slightly over the past twelve months, as I’ve been trying to read some Berthoud, Saunier, et al, in the original French. ^ Daniels, in The Art of Breguet, makes a couple of interesting observations about jumping hour hands: 1) the complication is not particularly useful, and 2) it can, in fact, cause the wearer to completely misjudge the time, especially when used to reading a “normal” time display. ^^ Saunier’s Treatise on Modern Horology also has a useful section on detent escapements. Disclaimer: I received a Press Pass for SalonQP 2015, and have written for QP Magazine, most recently in Issue 75. Tickets to all three days of this event would have cost in the region of £200.